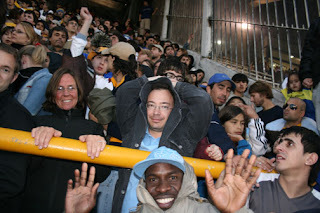 Mi Vida Sigue - My Life Continues: Buenos Aires: GOAL! PHOTO CAPTIONS: 1. La Boca Soccer Stadium, Buenos Aires, 2. Andre and me at the match, 3. Ronald and Jean in the crowd, 4. Andre playing racquetball with club manager Jose, 5. me in the Holocaust Museum, 6. view of El Tigre resort town, 7. 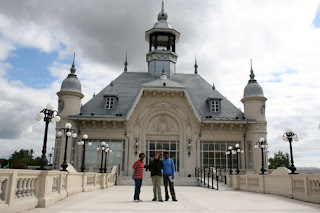 Andre, Jean and Ronald at the Tigre Art Museum, 8. 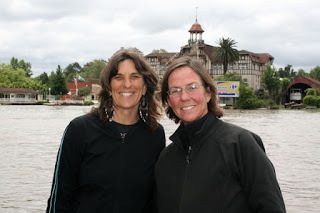 Jean and Chelsea in Tigre. The Argentine soccer fans are nuts. 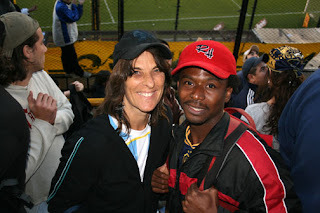 Andre and I, along with my friend Jean and his friend Ronald, went to a big soccer match at La Boca stadium, home of Diego Maradona who I remember from the late 1980s. No one's forgotten him around here either. We got totally ripped off by this tour guide company which Jean's hostel recommended. They suckered a whole busload of unsuspecting tourists to pay $45 for the package deal. We waited on the bus for an hour, drove 1-mile drive to the stadium, waited on the bus for 45-minutes. Then they took us into a pub and served us lousy pizza and bottles of Brahma beer. Afterwards, they herded us back into the bus and drove a few more blocks. When we got into the stadium finally, we were basically abandoned, left to fight our way up the bleachers so we wouldn't be looking through the chain link and metal poles. Instead of reserved seats as I'd expected, our 14 peso tickets (Jean's said 7 pesos which is barely over $2) were for the "popular" section, which is the most dangerous -- especially since the opposing team's fans were right above and kept spitting and hacking at us. It was hard to watch the action while ducking under our jackets and keeping one eye on the balcony above. 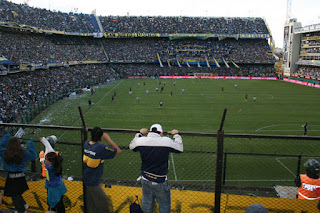 Some idiot worker must have left a bag of cement up above, which these maniacs were breaking up and throwing down on the Boca fans. Eventually they dumped the whole bag, which luckily missed killing anyone. The Boca fans weren't exactly saints either. I couldn't believe it when they started chanting about the "putos" (fags) on the opposing team. Even the little kids would yell out "Putos!" at the top of their lungs whenever a call didn't go our way. We won resoundingly, 4-0. The night before, Ronald invited us to a birthday party for one of his Haitian friends, which Jean politely declined. She had to get up early to move from the hostel into a family home, as part of a Spanish language program. Ronald and his friends are all 7th-Day Adventist missionaries. There were about 10 at the party. I was tired before we left, but came to life once I sat next to a Canadian woman named Trudy and her Haitian fiance Mike. Turns out she's 47 and he's 22. One of her kids is older than he is. They met online in June and in person two weeks ago. Tomorrow they get married, then she goes back to Canada a few days later. We definitely had a lot to talk about. Turns out, she'll be able to get Mike into her country in six months or sooner. She hasn't told her mother or one of her kids yet. She told them she was going skiing. Trudy kept raving about how nice all the Haitians are and how they don't make men like that in North America anymore. She said Mike's the sweetest man she's ever met, that he's much more interested in what's in a woman's heart rather than her physical appearance. I've been hearing the same thing from Andre, his cousin Patrick, and his friend Junior. Maybe there's something to what she's saying. Mike did seem like a great guy, very mature and very attentive. Like Andre, he speaks several languages and his English is excellent. That's good because Trudy speaks only English, not even French. I've heard there are about 180,000 Haitians in Montreal, but very few in western Canada where she's from. But Mike will probably adapt just fine. He's very friendly and self-assured and getting used to a cold climate with no fried bananas. Today was a great day. Andre finally got his Uruguay visa. I thought we might have another delay, this time because of a protest by environmentalists outside the Uruguay embassy. It was all over the news. 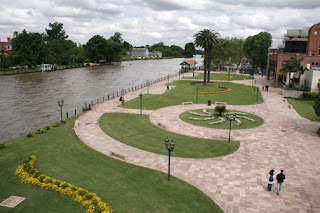 Argentines are furious because of the paper mill that Uruguay is putting in on the river that divides the two countries. Paper mills are extremely toxic, so they're afraid it will contaminate the water. I expected to get some good photos, but the crowd had dispersed by the time we picked up the passport in the afternoon. We also got to play racquetball for the first time in a month. And miracle of miracles: I played right-handed! Haven't done that in 2-1/2 months. I've been babying the tendinitus I got from kick boxing. But I wrapped my elbow and iced it afterwards, It actually feels fine so far. Hope i don't regret it tomorrow. The club has lots of gym equipment, 4 squash courts and one racquetball court. 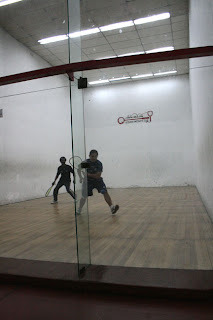 It used to be 3 and 2, but they converted one of the racquetball courts to squash because it's more popular. We played an hour by ourselves, then challenged the club manager. He's basically a soccer player who also plays squash. Andre and he split games, which were very close, and I beat him 15-4, 15-4. We made plans to play again tomorrow. 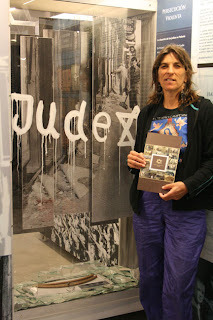 We went to the Holocaust Museum, which was well done, but small compared to the incredible one in Washington, D.C. There was a college class there, getting a tour. The weird thing about Argentina is they accepted thousands of Jewish refugees after WWII AND they welcomed Nazi criminals. I see yarmulkes around the city, but haven't spotted a synagogue yet. Or Nazis. Jean and I did read a flyer about skin-head neo-nazis in El Tigre, the fairy-tale resort town we went to by train. As soon as we stepped out of the station, Jean and I both had an overwhelming feeling we were in Disneyland, with the perfectly sculpted landscaping, the nice, clean river with its steamboats and canoes, the cute bridges and cobble-stone streets.. We had great fun spotting Main Street U.S.A., Tom Sawyer Island, the Haunted Mansion, New Orleans Square, Pirates of the Caribbean, and Fantasy Land. I'm reading a book about Evita and it turns out that she and Juan Peron had their first dates in El Tigre in the 1930s. Sounds exactly the same back then.